Microsoft has started testing the most awaited Windows 10 timeline feature. At the announcement of Windows 10 Fall Creators Update launch, one of the features Timeline is considered to the most awaited feature. Timeline enables you to search and resume your recent activities or tasks, no matter on which device PC, iOS or Android phones, you are logged on. It is a task switcher which is backed by Microsoft’s cloud services. However, it was not ready at the time of launch. People have been waiting for this feature to be released since then. Although, today, Timeline feature will make its debut in the latest Windows 10 Insider preview build for the users who have opted into the Skip Ahead builds or for the users who are in the more experimental Fast ring. WHY IT SEEMS IMPORTANT FOR MICROSOFT? The fundamental idea is to provide you with an overview of all the recent activities irrespective of laptop or phone you are on, be it a Word Document you were working on or website you were surfing.You can pick up from where you left off on your office computer or smartphone. 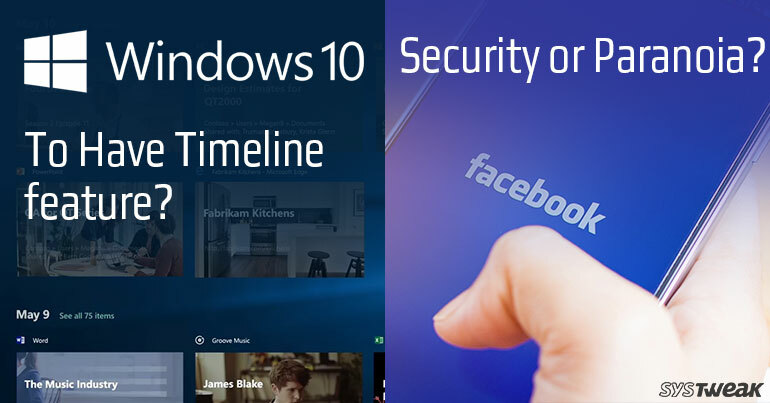 The timeline will also call your attention to the documents that you will probably want to work on along with the list of recent activities organized by an hour.Moreover, Microsoft digital assistant Cortana will remind you of tasks that you probably want to continue working on as you switch between your devices. App developers have to make necessary changes to make their app support the feature. For now, only Microsoft products such as Microsoft Office, Edge, Maps, Money and more are compatible with the new feature. You need to download and install the latest update. If you have installed the update, the new Timeline view can be located behind new task View icon at the taskbar. You can also use by pressing Windows key and plus tab. Another useful feature Sets is going to be released soon. Microsoft says that with the feature, you can assemble documents, apps and other files which is a part of a task and will make it accessible with a single click. Facebook will enable you to control your images online, even if they are not posted by you. According to the new feature, Facebook will keep you informed when someone posts your photo, even if you are not tagged in it. With this addition, the social media giant is bringing facial-recognition technology to our mundane life. The tech giant is hatching its new feature in a way in which people will be able to control their own images online. It also shows that Facebook is getting familiar with your face. Given the time, it is a smart move. Apple has replaced fingerprint reader from face recognition. Google has also introduced features into its photo service which assemble snapshots by people’s images. Facebook scans faces in photos and suggests friends names whom you can tag in pictures. However, the new feature will recognize you without any help. The condition for the new feature to work is you should have agreed to the tagging feature. From now on, Facebook facial scanning features will be under one privacy setting. In other words, you need to be okay with Facebook suggesting your friends to tag you to get notifications about where your face appears on users’ accounts. The introduction of the new feature will restrict impersonations, which is already prohibited but difficult to recognize. WHAT PEOPLE HAS TO SAY? Due to the concerns raised by people in Europe and Canada about the methods of collecting data by Facebook, the features will be rolled out in the United States. The feature will only apply to the new photos uploaded on the site, and will not scan through existing photos. How To Receive Security Code For Facebook Account?